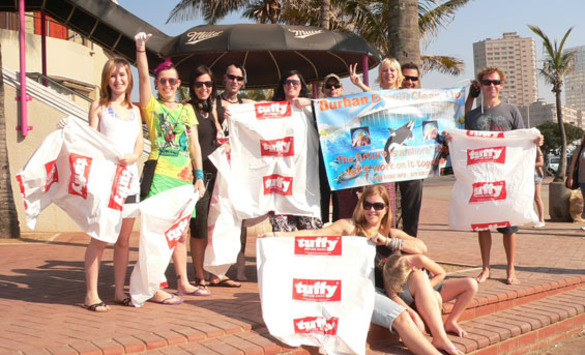 Community members gathered on Sunday to participate in a Durban beach cleanup that is held on a monthly basis. Bags were sponsored by Tuffy. As part of an ongoing initiative to keep the Durban beachfront clean, community members gathered on Sunday to pick up litter. This was the third monthly cleanup to be held and several big bags were filled to the top with all sorts of refuse. Community members are urged to show their support to this initiative. The cleanups are held once and the next one will be held on 17 September. All those involved meet outside Joe Kools at North Beach 9am. September is significant as it forms part of International Coastal Cleanup. According to Ocean Conservancy, trash is one of the most widespread problems threatening the ocean and waterways. Ocean Conservancy said that trash in the water can impact human health. Sharp items can cut beachgoers. Trash threatens wildlife as well. A whale can drown when entangled in old rope or fishing nets, and many fish, birds, and animals eat trash they mistake for food. This can result in choking, as well as slow starvation from a false sense of satiation. Ocean trash chokes coastal economies as well, deterring tourist visits and causing enormous cleanup bills. All are welcome to participate in the monthly Durban beachfront cleanups contact, For more information phone 079 980 5189. I would like to enquire as to when the next beach clean-up will be taking place? “Clean Surf Project ” have posted a video regarding “Cutting Beach”, Kzn, South Africa, well be having a clean up there on the 30 Sept 2017! 5km of devastating shore, plastic on some area’s a meter in depth and also buried plastic in a meter of depth! We gonna need serious assistance, all the bottles plastic wrapping is already gone into the ocean! Please help!! !